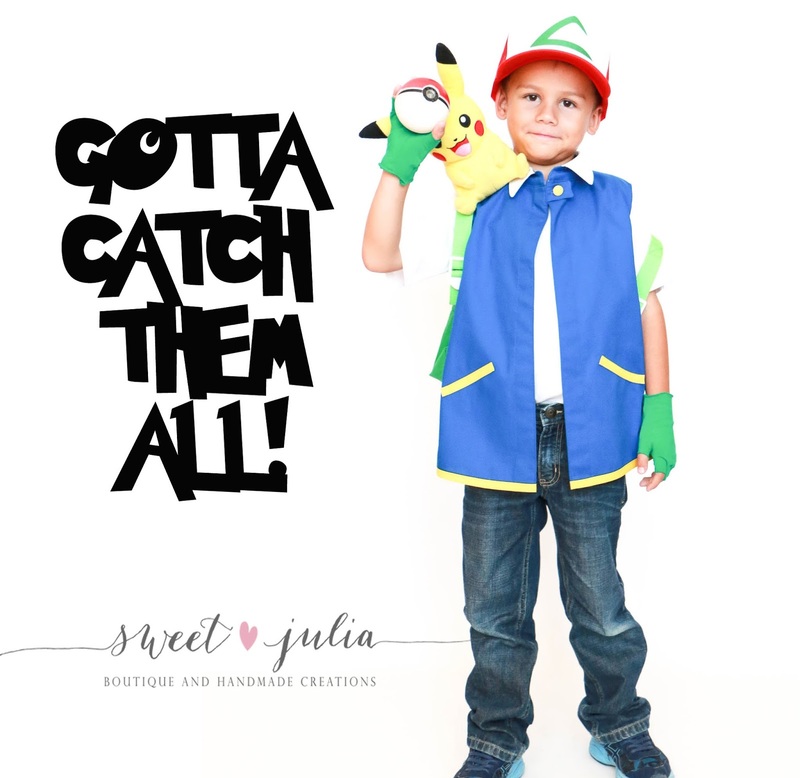 Sweet Julia Boutique: Halloween for boys! I'm so happy I got to finally sew a Halloween costume for my boy, woohoo!!! This is a rare occasion, me sewing for him and him letting me take photos, it was a win-win in the end. 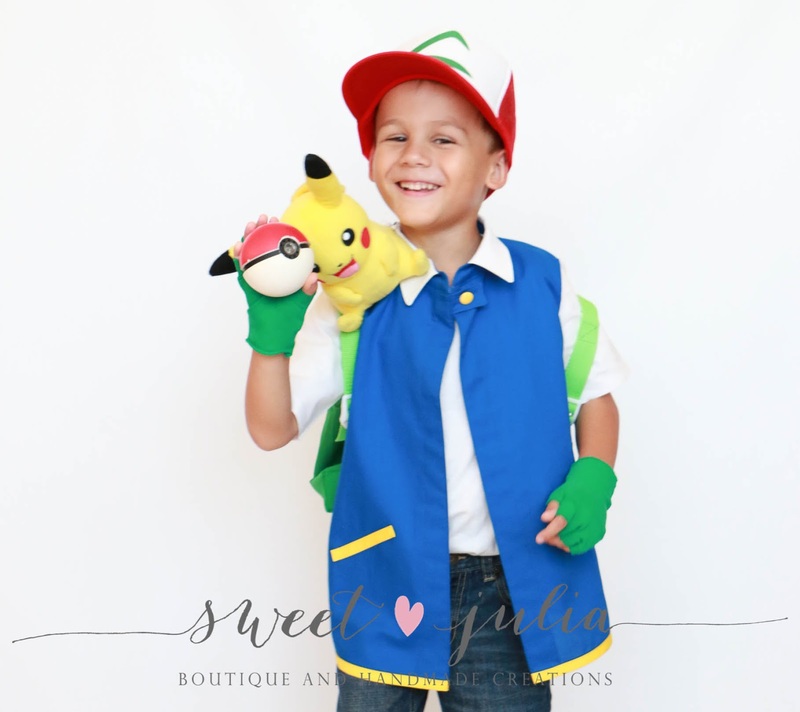 My 6 year old is obsessed, I really mean obsessed with Pokemon so he asked me to make him an Ash Ketchum, the main character, costume. After doing some image research, I finally narrowed down what I needed to make, and what we already had or needed to purchase. 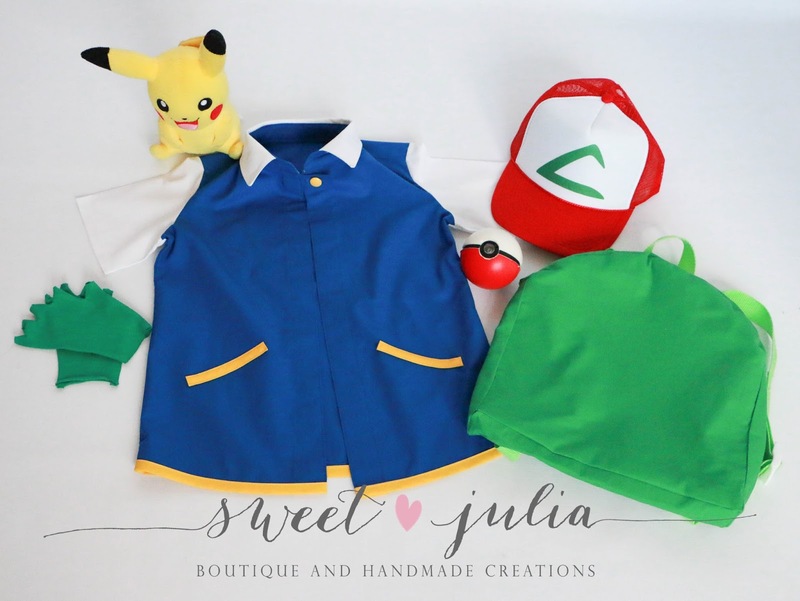 We already had a pokeball and Picachu plush toy, so everything else (except for pants and shoes) had to be made to accommodate this demanding, but sweet, boy. For the shirt, I modified Made for Mermaids' Charlie button up shirt, removing the pin tucks and changing up some of the steps so I could add bias trim at the bottom and faux pockets and a 3"x2" tab to add a button. 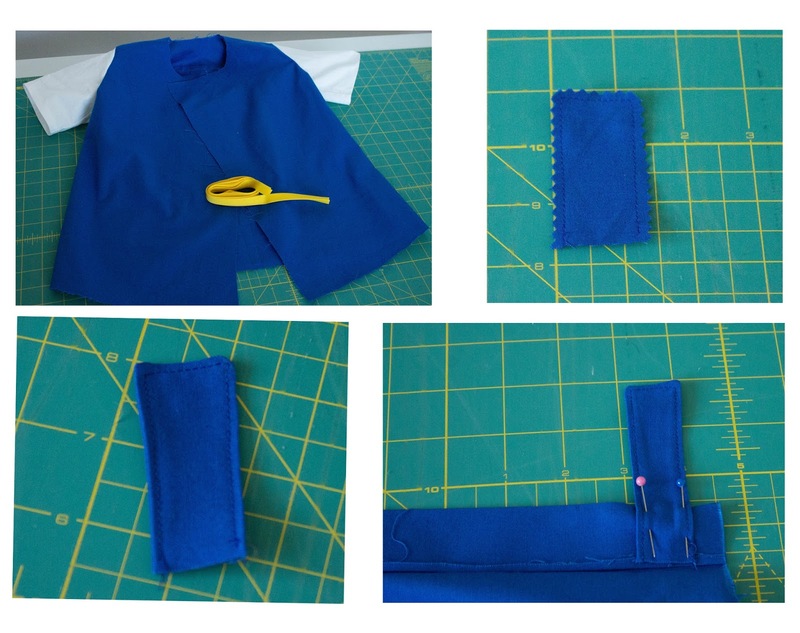 The good thing is, I didn't need all the buttons and buttonholes, just one at the top, secured by the added tab. For the gloves, I traced an existing pair of adult gloves and sewed with 1/4" seam allowance and then cut the fingers off. The green backpack was self drafted, a first but definitely not last for me. The cap was purchased from amazon.com for about $6.00. 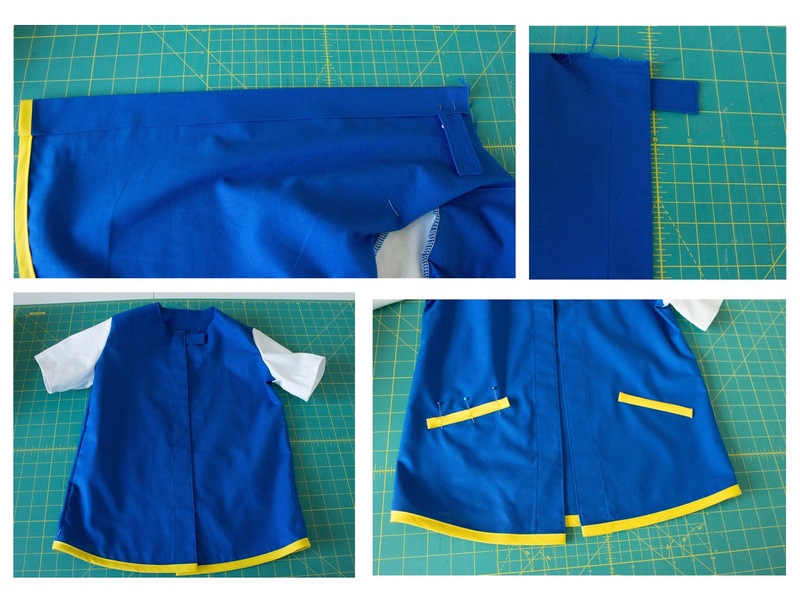 Here is a quick overview of the steps I took to modify the pattern to turn it into Ash's, I changed the order in which I followed the steps so I could have an opportunity to hide the bias tape and created the faux pockets with the same bias tape. 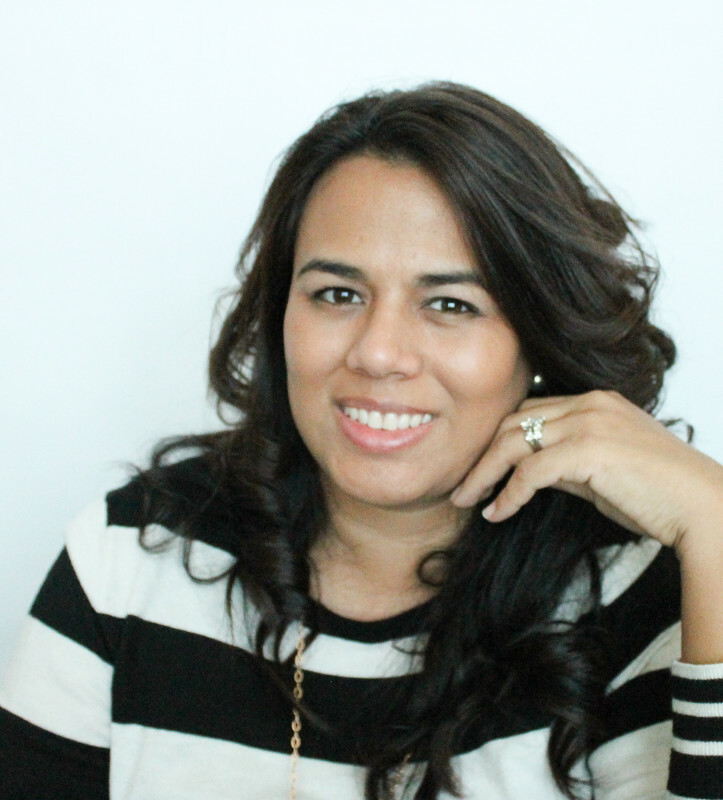 I think I can say: Mission Accomplished! Can you tell little man is happy?